It was a year that saw the end of DACA, a pardon for Sheriff Joe Arpaio, and increased immigration enforcement. There were natural disasters, a massive tax reform bill, and resistance efforts against President Trump. So how did the Latino community fare in 2017? NBC Latino spoke with experts, educators, and advocates, and found both serious cause for concern and cautious reason for optimism. "For Latino immigrants, it was an unfortunate and ominous year," said Professor Cristina M. Rodriguez of Yale University. "Ultimately the Trump administration may not result in more deportations that the Obama years, but we do know that this administration is trying to sow fear and reject common-sense measures for (undocumented) people who are otherwise law-abiding and contributing." In January, the president signed an executive order ending the Obama-era priorities for immigration enforcement, putting virtually all undocumented immigrants at risk for deportation. As a result, the first 90 days of his administration saw an almost 40 percent increase in immigration arrests, driven by a 150 percent spike in the arrests of non-criminal undocumented immigrants. Since then, arrests of non-criminals have surged. According to ICE statistics, the number of non-criminal immigrants arrested in 2017 increased by 250 percent, up to 13,600 compared to 5,498 in 2016. The Trump administration has sought curbs on both legal and illegal immigration, and has been ending humanitarian protection for those with Temporary Protected Status. "The climate around the Latino immigrant population has changed dramatically, and it is unclear what the future will bring," Rodriguez said. She cited the Trump administration's retreat on issues like monitoring police brutality and affirmative action as areas of concern. "The pardon (in August) of Joe Arpaio was a symbolic slap in the face to Latinos. Under any other administration, it would have been highly unlikely that Arpaio would have been pardoned. The pardon was a political gesture for someone who had nothing but contempt for the law." Such factors may be why some Latinos are not entirely secure about how they are regarded by other Americans. A November poll from NPR found that Latinos believe institutional discrimination remains a problem in the U.S. One in three Latinos reported that they have faced discrimination while applying for jobs, for equal pay, and when being considered for promotions. About 37 percent of those surveyed said they'd experienced racial or ethnic slurs. Hate crimes against Latinos have also been on the rise. Thomas A. Saenz, president and general counsel of the Mexican American Legal Defense and Educational Fund (MALDEF) said that he is troubled by the Trump administration's general attitude towards Latinos. "I understand why people feel like our community is under siege. A lot of that can be traced to the rhetoric that the president and some of his advisors have continued to put out there in oral statements and in tweets. It is compounded by Donald Trump's virtual complete exclusion of Latinos from his government," Saenz said. There are no Latinos of prominence in the White House, save for Secretary of Labor Alexander Acosta, and only one Latino among Trump's judicial nominees to federal courts." The September announcement of the termination of DACA was a low point of 2017, said Saenz. "Trump followed legal advice provided by an attorney general who doesn't give a damn about what the law is. It is troubling that Trump followed that advice, which was completely unsupported and holds extreme consequences for people." The ongoing attempts to weaken or repeal the Affordable Care Act was another negative development this year, Saenz said, as was the presence of Steve Bannon (now departed) and Stephen Miller in Trump's circle of advisors. "The fact that this administration has such deep ties to nativists and nationalists should be deeply disturbing to the entire country. The fact that it is not is disappointing." Saenz's concern about Latinos and healthcare is not misplaced. Thanks to "Obamacare," the uninsured rate for Hispanics has dropped from 24 percent in 2013 to 16 percent. These gains have been threatened by the Trump administration's cuts to federal subsidies and to outreach efforts for low-income people, and the shortening of the enrollment period for signups. Saenz is thankful that what he termed the Trump administration's "incompetence" has prevented them from enacting more policies that negatively impact Latinos and other Americans. "If they were better at what they want to do, we'd be in even more danger." There are several metrics that reflect positive developments in the Latino community. The Latino high school dropout rate has plummeted, and Latino` college enrollment has hit a record high. The Latino unemployment rate has returned to a historic low of 4.7 percent. Yet with Latino labor force participation at 66 percent and the employment/population ratio at 63 percent, it appears Latinos have not completely recovered from the Great Recession. What's more, this year Hurricanes Harvey, Irma, and Maria, walloped South Texas, Florida, and Puerto Rico, respectively - all areas home to significant Hispanic populations. Sineria Ordoñez, interim Executive Director of the Houston Hispanic Forum, told NBC that the immigration issue had impacted recovery efforts. "Our group has been active in delivering messaging on Harvey assistance, and we have found people who do not want to ask for help from the city of FEMA out of fear," she said. "We have undocumented or mixed status families continuing to live in apartments or homes that are damaged. The mayor has said that people should not be afraid to seek help, so we are trying to find ways to connect these communities with groups offering direct assistance." Filling our FEMA forms is often no easy task for native-English speakers, let alone for the many Spanish-speaking residents in Houston who are eligible for aid. "If you drive through Houston right now and look around, things look pretty good, because the city has cleaned up certain areas very quickly," Ordoñez said. "That is great, but it is only part of the story. We still have families who have been displaced for two, three months, looking for places to live. You can't replace a home in a matter of weeks when it is covered in mold. So recovery for us is going to be a long-term effort." She is proud of the volunteers who have come together to help their fellow Houstonians. "We have people from all socio-economic, political, and religious backgrounds working to rebuild the city." Meanwhile, the situation in Puerto Rico remains dire. "For Puerto Rico, the catastrophe of Maria changed everything, from the way we look at the debt situation to the prospects for getting out of the economic crisis to the island's long-term future," said Edwin Melendez, director of Centro, the Center for Puerto Rican Studies at Hunter College, City University of New York. "What began as an economic crisis became a humanitarian crisis coupled with a political crisis." Hurricane Maria slammed into Puerto Rico in September. Amid the devastation, San Juan Mayor Carmen Yulin Cruz emerged as a national figure, pleading for help for people on the island. 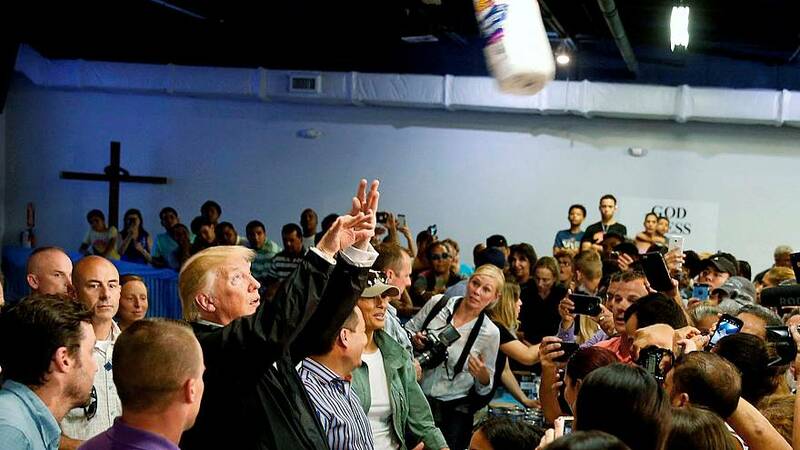 Shortly thereafter, President Trump visited the island, where he playfully tossed paper towels into a crowd of hurricane survivors, a gesture which drew widespread criticism. Trump pointed to the initial death toll of 16 and implied that the Category Four storm had not been a "real catastrophe" like Katrina. Since then, multiple media reports have suggested that the actual death toll from the storm may be much higher. After the New York Times attributed at least one thousand deaths to the storm and its aftermath, Puerto Rico's governor ordered a recount of the death total. "There are a lot of people in Puerto Rico and on the mainland who feel insulted by the way Trump has handled the situation," Melendez said, "and that was reflective of the overall federal attention to Puerto Rico on the ground." FEMA's attention to the island has been erratic, he asserted, and many Puerto Ricans have wondered why the federal response was so slow, compared with the response to Harvey. In Puerto Rico, thousands of people are still without water or power. Melendez says that Maria may ultimately reconfigure the Puerto Rican diaspora, because so many Puerto Ricans from the island are relocating to the mainland. "This will reshape the way the U.S. relates to Puerto Rico, as people stateside start to question and advocate for new policies for the Commonwealth." If there are any silver linings to Hurricane Maria, Melendez said it is that the disaster has raised awareness of the fact that Puerto Ricans are U.S. citizens, and that it has resulted in an outpouring of support and donations from the broader Latino community. Jennifer Lopez, Lin-Manuel Miranda, Tito El Bambino, and other celebrities all mounted high-profile relief efforts in support of hurricane survivors. 2017 also saw political developments that affected Latinos. In November, two Hispanics made history, becoming the first Latinas elected to the Virginia House of Delegates. Elizabeth Guzman and Hala Ayala both flipped their districts from Republican to Democrat, part of a larger "blue wave" of energized Democrats. In December, President Trump and the GOP scored a key victory by delivering on a promise of tax reform. Many economists say that this plan will benefit the wealthy and raise the deficit, while analysts note that it is unlikely to produce benefits for Latino families. The nonpartisan advocacy group UnidosUS, for example, concluded that Trump's tax reform will hurt working-class Latinos. Opponents of the plan say that most Latinos will experience a tax increase under the new law, while Puerto Rico's governor predicts it will crush the island's economy by slapping new taxes on goods and services moving between the island and the mainland. Not everyone agrees that the new tax reform will be bad for Latinos. "The economists I listen to say the impact of the tax bill on the average family will be better," said Alfonso Aguilar, president of the Latino Partnership for Conservative Principles. "I am hoping it will help Hispanics." Aguilar believes that 2017 has been a good year for Latinos. "For Hispanics, the most important issues are the economy and jobs, just like for other Americans. If we look at that, we see the economy growing and consistent job growth." On December 21, the Dow Jones Industrial Average closed at nearly 25,000. The president likes to take credit for this bullish market, though he inherited a growing economy from Barack Obama. Aguilar offered his view on polling that shows an overwhelming majority of Latinos disapprove of President Trump's job performance. "People don't like his personality, the way he talks, the way he tweets. He can sound angry, and he can offend," he said. "I don't think many Hispanics like Trump the man, or his style as a person, but I think many are willing to recognize that his policies may be good for the Hispanic community." People should not confuse Trump's sometimes-ugly rhetoric on immigration and the community with how the Hispanic community has been doing this year, Aguilar cautioned. He told NBC that Congress would likely take action on a clean DREAM Act before the end of the year. "The political will is there." However, in late December Congress passed a continuing resolution to keep the government open until January. It did not include any legislative fix for DACA, leaving immigrant advocates feeling angry, frustrated, and betrayed - especially by the Democrats who voted for the resolution. Amid the ups and downs of 2017, some grass-roots organizations found reason to be optimistic. "It was a stressful year," said Marcos Martinez, executive director of Casa Latina in Seattle, a nonprofit that serves immigrant day laborers and domestic workers. "But we have seen an outpouring of support from people who want to help our Latino immigrant community. It has been a year of increased empathy from the non-immigrant community, wanting to know what they can do." Casa Latina's annual fundraising gala broke records, Martinez reports, and local faith leaders have let him know that their churches are available for sanctuary if needed. "Our Latino immigrant community is feeling a lot of pressure," Martinez acknowledged. "But there is cause for optimism because we have great elected leaders, volunteers, donors, and everyday people who turnout and want to support immigrant workers - and those are all things to feel good about." Follow Raul A. Reyes on Twitter at @RaulAReyes and Instagram at @raulareyes1.